"Extinction level event" redirects here. For other uses, see Extinction Level Event (disambiguation). This article is about mass extinction. For other uses, see Extinction Event (disambiguation). In a landmark paper published in 1982, Jack Sepkoski and David M. Raup identified five mass extinctions. They were originally identified as outliers to a general trend of decreasing extinction rates during the Phanerozoic, but as more stringent statistical tests have been applied to the accumulating data, it has been established that multicellular animal life has experienced five major and many minor mass extinctions. The "Big Five" cannot be so clearly defined, but rather appear to represent the largest (or some of the largest) of a relatively smooth continuum of extinction events. Ordovician–Silurian extinction events (End Ordovician or O–S): 450–440 Ma (million years ago) at the Ordovician–Silurian transition. Two events occurred that killed off 27% of all families, 57% of all genera and 60% to 70% of all species. Together they are ranked by many scientists as the second largest of the five major extinctions in Earth's history in terms of percentage of genera that became extinct. Late Devonian extinction: 375–360 Ma near the Devonian–Carboniferous transition. At the end of the Frasnian Age in the later part(s) of the Devonian Period, a prolonged series of extinctions eliminated about 19% of all families, 50% of all genera and at least 70% of all species. This extinction event lasted perhaps as long as 20 million years, and there is evidence for a series of extinction pulses within this period. Permian–Triassic extinction event (End Permian): 252 Ma at the Permian–Triassic transition. Earth's largest extinction killed 57% of all families, 83% of all genera and 90% to 96% of all species (53% of marine families, 84% of marine genera, about 96% of all marine species and an estimated 70% of land species, including insects). The highly successful marine arthropod, the trilobite, became extinct. The evidence regarding plants is less clear, but new taxa became dominant after the extinction. The "Great Dying" had enormous evolutionary significance: on land, it ended the primacy of mammal-like reptiles. The recovery of vertebrates took 30 million years, but the vacant niches created the opportunity for archosaurs to become ascendant. In the seas, the percentage of animals that were sessile dropped from 67% to 50%. The whole late Permian was a difficult time for at least marine life, even before the "Great Dying". Triassic–Jurassic extinction event (End Triassic): 201.3 Ma at the Triassic–Jurassic transition. About 23% of all families, 48% of all genera (20% of marine families and 55% of marine genera) and 70% to 75% of all species became extinct. Most non-dinosaurian archosaurs, most therapsids, and most of the large amphibians were eliminated, leaving dinosaurs with little terrestrial competition. Non-dinosaurian archosaurs continued to dominate aquatic environments, while non-archosaurian diapsids continued to dominate marine environments. The Temnospondyl lineage of large amphibians also survived until the Cretaceous in Australia (e.g., Koolasuchus). Cretaceous–Paleogene extinction event (End Cretaceous, K–Pg extinction, or formerly K–T extinction): 66 Ma at the Cretaceous (Maastrichtian) – Paleogene (Danian) transition interval. 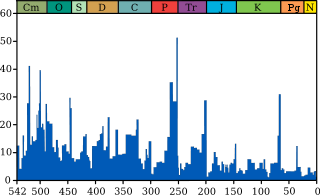 The event formerly called the Cretaceous-Tertiary or K–T extinction or K–T boundary is now officially named the Cretaceous–Paleogene (or K–Pg) extinction event. About 17% of all families, 50% of all genera and 75% of all species became extinct. In the seas all the ammonites, plesiosaurs and mosasaurs disappeared and the percentage of sessile animals (those unable to move about) was reduced to about 33%. All non-avian dinosaurs became extinct during that time. The boundary event was severe with a significant amount of variability in the rate of extinction between and among different clades. Mammals and birds, the latter descended from theropod dinosaurs, emerged as dominant large land animals. Despite the popularization of these five events, there is no definite line separating them from other extinction events; using different methods of calculating an extinction's impact can lead to other events featuring in the top five. Older fossils are harder to find as they are usually buried at a considerable depth. Productive fossil beds are researched more than unproductive ones, therefore leaving certain periods unresearched. Prehistoric environmental events can disturb the deposition process. It has been suggested that the apparent variations in marine biodiversity may actually be an artifact, with abundance estimates directly related to quantity of rock available for sampling from different time periods. However, statistical analysis shows that this can only account for 50% of the observed pattern, and other evidence (such as fungal spikes)[clarification needed] provides reassurance that most widely accepted extinction events are real. A quantification of the rock exposure of Western Europe indicates that many of the minor events for which a biological explanation has been sought are most readily explained by sampling bias. 6. Holocene extinction: Currently ongoing. Extinctions have occurred at over 1000 times the background extinction rate since 1900. The mass extinction is a result of human activity. More recent research has indicated that the End-Capitanian extinction event likely constitutes a separate extinction event from the Permian–Triassic extinction event; if so, it would be larger than many of the "Big Five" extinction events. For example, mammaliformes ("almost mammals") and then mammals existed throughout the reign of the dinosaurs, but could not compete for the large terrestrial vertebrate niches which dinosaurs monopolized. The end-Cretaceous mass extinction removed the non-avian dinosaurs and made it possible for mammals to expand into the large terrestrial vertebrate niches. Ironically, the dinosaurs themselves had been beneficiaries of a previous mass extinction, the end-Triassic, which eliminated most of their chief rivals, the crurotarsans. Furthermore, many groups which survive mass extinctions do not recover in numbers or diversity, and many of these go into long-term decline, and these are often referred to as "Dead Clades Walking". However, clades that survive for a considerable period of time after a mass extinction, and which were reduced to only a few species, are likely to have experienced a rebound effect called the "push of the past". Darwin was firmly of the opinion that biotic interactions, such as competition for food and space—the ‘struggle for existence’—were of considerably greater importance in promoting evolution and extinction than changes in the physical environment. He expressed this in The Origin of Species: "Species are produced and exterminated by slowly acting causes…and the most import of all causes of organic change is one which is almost independent of altered…physical conditions, namely the mutual relation of organism to organism-the improvement of one organism entailing the improvement or extermination of others". It has been suggested variously that extinction events occurred periodically, every 26 to 30 million years, or that diversity fluctuates episodically every ~62 million years. Various ideas attempt to explain the supposed pattern, including the presence of a hypothetical companion star to the sun, oscillations in the galactic plane, or passage through the Milky Way's spiral arms. However, other authors have concluded that the data on marine mass extinctions do not fit with the idea that mass extinctions are periodic, or that ecosystems gradually build up to a point at which a mass extinction is inevitable. Many of the proposed correlations have been argued to be spurious. Others have argued that there is strong evidence supporting periodicity in a variety of records, and additional evidence in the form of coincident periodic variation in nonbiological geochemical variables. There is still debate about the causes of all mass extinctions. In general, large extinctions may result when a biosphere under long-term stress undergoes a short-term shock. An underlying mechanism appears to be present in the correlation of extinction and origination rates to diversity. High diversity leads to a persistent increase in extinction rate; low diversity to a persistent increase in origination rate. These presumably ecologically controlled relationships likely amplify smaller perturbations (asteroid impacts, etc.) to produce the global effects observed. A good theory for a particular mass extinction should: (i) explain all of the losses, not just focus on a few groups (such as dinosaurs); (ii) explain why particular groups of organisms died out and why others survived; (iii) provide mechanisms which are strong enough to cause a mass extinction but not a total extinction; (iv) be based on events or processes that can be shown to have happened, not just inferred from the extinction. It may be necessary to consider combinations of causes. For example, the marine aspect of the end-Cretaceous extinction appears to have been caused by several processes which partially overlapped in time and may have had different levels of significance in different parts of the world. Arens and West (2006) proposed a "press / pulse" model in which mass extinctions generally require two types of cause: long-term pressure on the eco-system ("press") and a sudden catastrophe ("pulse") towards the end of the period of pressure. Their statistical analysis of marine extinction rates throughout the Phanerozoic suggested that neither long-term pressure alone nor a catastrophe alone was sufficient to cause a significant increase in the extinction rate. Asteroid impacts: one large impact is associated with a mass extinction, i.e. the Cretaceous–Paleogene extinction event; there have been many smaller impacts but they are not associated with significant extinctions. Flood basalt events occur as pulses of activity punctuated by dormant periods. As a result, they are likely to cause the climate to oscillate between cooling and warming, but with an overall trend towards warming as the carbon dioxide they emit can stay in the atmosphere for hundreds of years. It is speculated that massive volcanism caused or contributed to the End-Permian, End-Triassic and End-Cretaceous extinctions. The correlation between gigantic volcanic events expressed in the large igneous provinces and mass extinctions was shown for the last 260 Myr. Recently such possible correlation was extended for the whole Phanerozoic Eon. These are often clearly marked by worldwide sequences of contemporaneous sediments which show all or part of a transition from sea-bed to tidal zone to beach to dry land – and where there is no evidence that the rocks in the relevant areas were raised by geological processes such as orogeny. Sea-level falls could reduce the continental shelf area (the most productive part of the oceans) sufficiently to cause a marine mass extinction, and could disrupt weather patterns enough to cause extinctions on land. But sea-level falls are very probably the result of other events, such as sustained global cooling or the sinking of the mid-ocean ridges. Sea-level falls are associated with most of the mass extinctions, including all of the "Big Five"—End-Ordovician, Late Devonian, End-Permian, End-Triassic, and End-Cretaceous. A study, published in the journal Nature (online June 15, 2008) established a relationship between the speed of mass extinction events and changes in sea level and sediment. The study suggests changes in ocean environments related to sea level exert a driving influence on rates of extinction, and generally determine the composition of life in the oceans. The impact of a sufficiently large asteroid or comet could have caused food chains to collapse both on land and at sea by producing dust and particulate aerosols and thus inhibiting photosynthesis. Impacts on sulfur-rich rocks could have emitted sulfur oxides precipitating as poisonous acid rain, contributing further to the collapse of food chains. Such impacts could also have caused megatsunamis and/or global forest fires. Most paleontologists now agree that an asteroid did hit the Earth about 66 Ma ago, but there is an ongoing dispute whether the impact was the sole cause of the Cretaceous–Paleogene extinction event. Sustained and significant global cooling could kill many polar and temperate species and force others to migrate towards the equator; reduce the area available for tropical species; often make the Earth's climate more arid on average, mainly by locking up more of the planet's water in ice and snow. The glaciation cycles of the current ice age are believed to have had only a very mild impact on biodiversity, so the mere existence of a significant cooling is not sufficient on its own to explain a mass extinction. It has been suggested that global cooling caused or contributed to the End-Ordovician, Permian–Triassic, Late Devonian extinctions, and possibly others. Sustained global cooling is distinguished from the temporary climatic effects of flood basalt events or impacts. The most dramatic example of sustained warming is the Paleocene–Eocene Thermal Maximum, which was associated with one of the smaller mass extinctions. It has also been suggested to have caused the Triassic–Jurassic extinction event, during which 20% of all marine families became extinct. Furthermore, the Permian–Triassic extinction event has been suggested to have been caused by warming. The bio-availability of essential trace elements (in particular selenium) to potentially lethal lows has been shown to coincide with, and likely have contributed to, at least three mass extinction events in the oceans, i.e. at the end of the Ordovician, during the Middle and Late Devonian, and at the end of the Triassic. During periods of low oxygen concentrations very soluble selenate (Se6+) is converted into much less soluble selenide (Se2-), elemental Se and organo-selenium complexes. Bio-availability of selenium during these extinction events dropped to about 1% of the current oceanic concentration, a level that has been proven lethal to many extant organisms. A nearby gamma-ray burst (less than 6000 light-years away) would be powerful enough to destroy the Earth's ozone layer, leaving organisms vulnerable to ultraviolet radiation from the Sun. Gamma ray bursts are fairly rare, occurring only a few times in a given galaxy per million years. It has been suggested that a supernova or gamma ray burst caused the End-Ordovician extinction. One theory is that periods of increased geomagnetic reversals will weaken Earth's magnetic field long enough to expose the atmosphere to the solar winds, causing oxygen ions to escape the atmosphere in a rate increased by 3–4 orders, resulting in a disastrous decrease in oxygen. Movement of the continents into some configurations can cause or contribute to extinctions in several ways: by initiating or ending ice ages; by changing ocean and wind currents and thus altering climate; by opening seaways or land bridges which expose previously isolated species to competition for which they are poorly adapted (for example, the extinction of most of South America's native ungulates and all of its large metatherians after the creation of a land bridge between North and South America). Occasionally continental drift creates a super-continent which includes the vast majority of Earth's land area, which in addition to the effects listed above is likely to reduce the total area of continental shelf (the most species-rich part of the ocean) and produce a vast, arid continental interior which may have extreme seasonal variations. Another theory is that the creation of the super-continent Pangaea contributed to the End-Permian mass extinction. Pangaea was almost fully formed at the transition from mid-Permian to late-Permian, and the "Marine genus diversity" diagram at the top of this article shows a level of extinction starting at that time which might have qualified for inclusion in the "Big Five" if it were not overshadowed by the "Great Dying" at the end of the Permian. Many other hypotheses have been proposed, such as the spread of a new disease, or simple out-competition following an especially successful biological innovation. But all have been rejected, usually for one of the following reasons: they require events or processes for which there is no evidence; they assume mechanisms which are contrary to the available evidence; they are based on other theories which have been rejected or superseded. Scientists have been concerned that human activities could cause more plants and animals to become extinct than any point in the past. Along with human-made changes in climate (see above), some of these extinctions could be caused by overhunting, overfishing, invasive species, or habitat loss. A study published in May 2017 in Proceedings of the National Academy of Sciences argued that a “biological annihilation” akin to a sixth mass extinction event is underway as a result of anthropogenic causes, such as over-population and over-consumption. The study suggested that as much as 50% of the number of animal individuals that once lived on Earth were already extinct, threatening the basis for human existence too. 2 levels drop to 10 ppm. With all photosynthetic organisms gone, atmospheric oxygen can no longer be replenished, and is eventually removed by chemical reactions in the atmosphere, perhaps from volcanic eruptions. Eventually the loss of oxygen will cause all remaining aerobic life to die out via asphyxiation, leaving behind only simple anaerobic prokaryotes. When the Sun becomes 10% brighter in about a billion years, Earth will suffer a moist greenhouse effect resulting in its oceans boiling away, while the Earth's liquid outer core cools due to the inner core's expansion and causes the Earth's magnetic field to shut down. In the absence of a magnetic field, charged particles from the Sun will deplete the atmosphere and further increase the Earth's temperature to an average of ~420 K (147 °C, 296 °F) in 2.8 billion years, causing the last remaining life on Earth to die out. This is the most extreme instance of a climate-caused extinction event. Since this will only happen late in the Sun's life, such will cause the final mass extinction in Earth's history (albeit a very long extinction event). The impact of mass extinction events varied widely. After a major extinction event, usually only weedy species survive due to their ability to live in diverse habitats. Later, species diversify and occupy empty niches. Generally, biodiversity recovers 5 to 10 million years after the extinction event. In the most severe mass extinctions it may take 15 to 30 million years. The worst event, the Permian–Triassic extinction, devastated life on earth, killing over 90% of species. Life seemed to recover quickly after the P-T extinction, but this was mostly in the form of disaster taxa, such as the hardy Lystrosaurus. The most recent research indicates that the specialized animals that formed complex ecosystems, with high biodiversity, complex food webs and a variety of niches, took much longer to recover. It is thought that this long recovery was due to successive waves of extinction which inhibited recovery, as well as prolonged environmental stress which continued into the Early Triassic. Recent research indicates that recovery did not begin until the start of the mid-Triassic, 4M to 6M years after the extinction; and some writers estimate that the recovery was not complete until 30M years after the P-T extinction, i.e. in the late Triassic. Subsequent to the P-T extinction, there was an increase in provincialization, with species occupying smaller ranges – perhaps removing incumbents from niches and setting the stage for an eventual rediversification. The effects of mass extinctions on plants are somewhat harder to quantify, given the biases inherent in the plant fossil record. 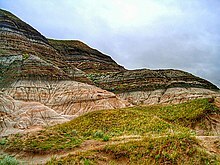 Some mass extinctions (such as the end-Permian) were equally catastrophic for plants, whereas others, such as the end-Devonian, did not affect the flora. ^ Dissolved oxygen became more widespread and penetrated to greater depths; the development of life on land reduced the run-off of nutrients and hence the risk of eutrophication and anoxic events; and marine ecosystems became more diversified so that food chains were less likely to be disrupted. ^ Nee, S. (2004). "Extinction, slime, and bottoms". PLoS Biology. 2 (8): E272. doi:10.1371/journal.pbio.0020272. PMC 509315. PMID 15314670. ^ a b Ward, Peter D (2006). "Impact from the Deep". Scientific American. Kluger, Jeffrey (July 25, 2014). "The Sixth Great Extinction Is Underway – and We're to Blame". Time. Retrieved December 14, 2016. Kaplan, Sarah (June 22, 2015). "Earth is on brink of a sixth mass extinction, scientists say, and it's humans' fault". The Washington Post. Retrieved December 14, 2016. Hance, Jeremy (October 20, 2015). "How humans are driving the sixth mass extinction". The Guardian. Retrieved December 14, 2016. "Vanishing: The Earth's 6th mass extinction". CNN. Retrieved December 19, 2016. ^ Butterfield, N.J. (2007). "Macroevolution and macroecology through deep time". Palaeontology. 50 (1): 41–55. doi:10.1111/j.1475-4983.2006.00613.x. ^ a b c d e f Alroy, J. (2008). "Dynamics of origination and extinction in the marine fossil record". Proceedings of the National Academy of Sciences of the United States of America. 105 (Supplement 1): 11536–42. Bibcode:2008PNAS..10511536A. doi:10.1073/pnas.0802597105. PMC 2556405. PMID 18695240. ^ Gould, S.J. (March 1, 2004). "The Evolution of Life on Earth". Scientific American. ^ a b c d e "extinction". Math.ucr.edu. Retrieved 2008-11-09. ^ Briggs, Derek; Crowther, Peter R. (2008). Palaeobiology II. John Wiley & Sons. p. 223. ISBN 978-0-470-99928-8. ^ St. Fleur, Nicholas (16 February 2017). "After Earth's Worst Mass Extinction, Life Rebounded Rapidly, Fossils Suggest". The New York Times. Retrieved 17 February 2017. ^ Labandeira CC, Sepkoski JJ (1993). "Insect diversity in the fossil record" (PDF). Science. 261 (5119): 310–15. Bibcode:1993Sci...261..310L. CiteSeerX 10.1.1.496.1576. doi:10.1126/science.11536548. PMID 11536548. ^ McElwain, J.C.; Punyasena, S.W. (2007). "Mass extinction events and the plant fossil record". Trends in Ecology & Evolution. 22 (10): 548–57. doi:10.1016/j.tree.2007.09.003. PMID 17919771. ^ Sahney S.; Benton M.J. (2008). "Recovery from the most profound mass extinction of all time". Proceedings of the Royal Society B: Biological Sciences. 275 (1636): 759–65. doi:10.1098/rspb.2007.1370. PMC 2596898. PMID 18198148. ^ Macleod, N.; Rawson, P. F.; Forey, P.L. ; Banner, F.T. ; Boudagher-Fadel, M.K. ; Bown, P.R. ; Burnett, J.A. ; Chambers, P.; Culver, S.; Evans, S.E. ; Jeffery, C.; Kaminski, M.A. ; Lord, A.R. ; Milner, A.C.; Milner, A.R. ; Morris, N.; Owen, E.; Rosen, B.R. ; Smith, A.B. ; Taylor, P.D. ; Urquhart, E.; Young, J.R. (April 1997). "The Cretaceous-Tertiary biotic transition". Journal of the Geological Society. 154 (2): 265–92. Bibcode:1997JGSoc.154..265M. doi:10.1144/gsjgs.154.2.0265. ^ Raup, D.; Sepkoski Jr, J. (1982). "Mass extinctions in the marine fossil record". Science. 215 (4539): 1501–03. Bibcode:1982Sci...215.1501R. doi:10.1126/science.215.4539.1501. PMID 17788674. ^ Fastovsky DE, Sheehan PM (2005). "The extinction of the dinosaurs in North America". GSA Today. 15 (3): 4–10. doi:10.1130/1052-5173(2005)15<4:TEOTDI>2.0.CO;2. ISSN 1052-5173. ^ McGhee, G.R. ; Sheehan, P.M.; Bottjer, D.J. ; Droser, M.L. (2011). "Ecological ranking of Phanerozoic biodiversity crises: The Serpukhovian (early Carboniferous) crisis had a greater ecological impact than the end-Ordovician". Geology. 40 (2): 147–50. Bibcode:2012Geo....40..147M. doi:10.1130/G32679.1. ^ Sole, R.V., and Newman, M., 2002. "Extinctions and Biodiversity in the Fossil Record – Volume Two, The Earth system: biological and ecological dimensions of global environment change" pp. 297–391, Encyclopedia of Global Environmental Change John Wilely & Sons. ^ Smith, A.; A. McGowan (2005). "Cyclicity in the fossil record mirrors rock outcrop area". Biology Letters. 1 (4): 443–45. doi:10.1098/rsbl.2005.0345. PMC 1626379. PMID 17148228. ^ Smith, Andrew B.; McGowan, Alistair J. (2007). "The shape of the Phanerozoic marine palaeodiversity curve: How much can be predicted from the sedimentary rock record of Western Europe?". Palaeontology. 50 (4): 765–74. doi:10.1111/j.1475-4983.2007.00693.x. ^ Malcolm L. McCallum (27 May 2015). "Vertebrate biodiversity losses point to a sixth mass extinction". Biodiversity and Conservation. 24 (10): 2497–519. doi:10.1007/s10531-015-0940-6. ^ Pimm, S.L. ; Jenkins, C.N. ; Abell, R.; Brooks, T.M. ; Gittleman, J. L.; Joppa, L.N. ; Raven, P.H. ; Roberts, C.M. ; Sexton, J.O. (30 May 2014). "The biodiversity of species and their rates of extinction, distribution, and protection". Science. 344 (6187): 1246752. doi:10.1126/science.1246752. PMID 24876501. ^ "It's official: a global mass extinction is under way – JSTOR Daily". 3 July 2015. ^ "We're Entering A Sixth Mass Extinction, And It's Our Fault". ^ a b Sutter, John D. (July 11, 2017). "Sixth mass extinction: The era of 'biological annihilation'". CNN. Retrieved July 17, 2017. ^ Benton, M.J. (2004). "6. Reptiles Of The Triassic". Vertebrate Palaeontology. Blackwell. ISBN 978-0-04-566002-5. ^ Jablonski, D. (2002). "Survival without recovery after mass extinctions". PNAS. 99 (12): 8139–44. Bibcode:2002PNAS...99.8139J. doi:10.1073/pnas.102163299. PMC 123034. PMID 12060760. ^ Budd, G.E. ; Mann, R.P. (2018). "History is written by the victors: the effect of the push of the past on the fossil record". Evolution. 72 (11): 2276–91. doi:10.1111/evo.13593. PMC 6282550. PMID 30257040. ^ Beardsley, Tim (1988). "Star-struck?". Scientific American. ^ Raup, DM; Sepkoski Jr, JJ (1984). "Periodicity of extinctions in the geologic past". Proceedings of the National Academy of Sciences of the United States of America. 81 (3): 801–05. Bibcode:1984PNAS...81..801R. doi:10.1073/pnas.81.3.801. PMC 344925. PMID 6583680. 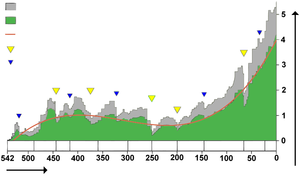 ^ Different cycle lengths have been proposed; e.g. by Rohde, R.; Muller, R. (2005). "Cycles in fossil diversity". Nature. 434 (7030): 208–10. Bibcode:2005Natur.434..208R. doi:10.1038/nature03339. PMID 15758998. ^ R.A. Muller. "Nemesis". Muller.lbl.gov. Retrieved 2007-05-19. ^ Adrian L. Melott; Richard K. Bambach (2010-07-02). "Nemesis Reconsidered". Monthly Notices of the Royal Astronomical Society. Retrieved 2010-07-02. ^ Gillman, Michael; Erenler, Hilary (2008). "The galactic cycle of extinction". International Journal of Astrobiology. 7 (1): 17–26. Bibcode:2008IJAsB...7...17G. CiteSeerX 10.1.1.384.9224. doi:10.1017/S1473550408004047. ISSN 1475-3006. Archived from the original (PDF) on |archive-url= requires |archive-date= (help). Retrieved 2018-04-02. ^ Bailer-Jones, C.A.L. (July 2009). "The evidence for and against astronomical impacts on climate change and mass extinctions: a review". International Journal of Astrobiology. 8 (3): 213–219. arXiv:0905.3919. Bibcode:2009IJAsB...8..213B. doi:10.1017/S147355040999005X. ISSN 1475-3006. Retrieved 2018-04-02. ^ Overholt, A.C.; Melott, A.L. ; Pohl, M. (2009). "Testing the link between terrestrial climate change and galactic spiral arm transit". The Astrophysical Journal. 705 (2): L101–03. arXiv:0906.2777. Bibcode:2009ApJ...705L.101O. doi:10.1088/0004-637X/705/2/L101. ^ Melott, A.L. ; Bambach, R.K. (2011). "A ubiquitous ~62-Myr periodic fluctuation superimposed on general trends in fossil biodiversity. I. Documentation". Paleobiology. 37: 92–112. arXiv:1005.4393. doi:10.1666/09054.1. ^ Melott, A.L. ; Bambach, Richard K.; Petersen, Kenni D.; McArthur, John M.; et al. (2012). "A ~60 Myr periodicity is common to marine-87Sr/86Sr, fossil biodiversity, and large-scale sedimentation: what does the periodicity reflect?". Journal of Geology. 120 (2): 217–26. arXiv:1206.1804. Bibcode:2012JG....120..217M. doi:10.1086/663877. ^ a b Arens, N.C.; West, I.D. (2008). "Press-pulse: a general theory of mass extinction?". Paleobiology. 34 (4): 456–71. doi:10.1666/07034.1. ^ a b c Wang, S.C.; Bush, A.M. (2008). "Adjusting global extinction rates to account for taxonomic susceptibility". Paleobiology. 34 (4): 434–55. doi:10.1666/07060.1. ^ Budd, G.E. (2003). "The Cambrian Fossil Record and the Origin of the Phyla". Integrative and Comparative Biology. 43 (1): 157–65. doi:10.1093/icb/43.1.157. PMID 21680420. ^ Martin, R.E. (1995). "Cyclic and secular variation in microfossil biomineralization: clues to the biogeochemical evolution of Phanerozoic oceans". Global and Planetary Change. 11 (1): 1–23. Bibcode:1995GPC....11....1M. doi:10.1016/0921-8181(94)00011-2. ^ Martin, R.E. (1996). "Secular increase in nutrient levels through the Phanerozoic: Implications for productivity, biomass, and diversity of the marine biosphere". PALAIOS. 11 (3): 209–19. doi:10.2307/3515230. JSTOR 3515230. ^ Marshall, C.R. ; Ward, P.D. (1996). "Sudden and Gradual Molluscan Extinctions in the Latest Cretaceous of Western European Tethys". Science. 274 (5291): 1360–63. Bibcode:1996Sci...274.1360M. doi:10.1126/science.274.5291.1360. PMID 8910273. ^ MacLeod, N (2001-01-06). "Extinction!". ^ Courtillot, V., Jaeger, J-J., Yang, Z., Féraud, G., Hofmann, C. (1996). "The influence of continental flood basalts on mass extinctions: where do we stand?" in Ryder, G., Fastovsky, D., and Gartner, S, eds. "The Cretaceous-Tertiary event and other catastrophes in earth history". The Geological Society of America, Special Paper 307, 513–525. ^ Hallam, A. (1992). Phanerozoic sea-level changes. New York: Columbia University Press. ISBN 978-0-231-07424-7. ^ Grieve, R.; Rupert, J.; Smith, J.; Therriault, A. (1996). "The record of terrestrial impact cratering". GSA Today. 5: 193–95. ^ The earliest known flood basalt event is the one which produced the Siberian Traps and is associated with the end-Permian extinction. ^ a b Some of the extinctions associated with flood basalts and sea-level falls were significantly smaller than the "major" extinctions, but still much greater than the background extinction level. ^ Wignall, P.B. (2001). "Large igneous provinces and mass extinctions". Earth-Science Reviews. 53 (1–2): 1–33. Bibcode:2001ESRv...53....1W. doi:10.1016/S0012-8252(00)00037-4. ^ Brannen, Peter (2017). The Ends of the World: Volcanic Apocalypses, Lethal Oceans, and Our Quest to Understand Earth's Past Mass Extinctions. Harper Collins. p. 336. ISBN 978-0-06-236480-7. ^ "Causes of the Cretaceous Extinction". ^ Courtillot, V. (1994). "Mass extinctions in the last 300 million years: one impact and seven flood basalts?". Israel Journal of Earth Sciences. 43: 255–266. ^ Courtillot, V.E., Renne, P.R., 2003. On the ages of flood basalt events. Comptes Rendus Geosciences 335 (1), 113–140. ^ Kravchinsky, V. A. (2012). "Paleozoic large igneous provinces of Northern Eurasia: Correlation with mass extinction events" (PDF). Global and Planetary Change. 86: 31–36. Bibcode:2012GPC....86...31K. doi:10.1016/j.gloplacha.2012.01.007. ^ Peters, S.E. (June 15, 2008). "Environmental determinants of extinction selectivity in the fossil record". Nature. 454 (7204): 626–29. Bibcode:2008Natur.454..626P. doi:10.1038/nature07032. PMID 18552839. ^ Newswise: Ebb and Flow of the Sea Drives World's Big Extinction Events Retrieved on June 15, 2008. ^ Alvarez, Walter; Kauffman, Erle; Surlyk, Finn; Alvarez, Luis; Asaro, Frank; Michel, Helen (Mar 16, 1984). "Impact theory of mass extinctions and the invertebrate fossil record". Science. 223 (4641): 1135–41. Bibcode:1984Sci...223.1135A. doi:10.1126/science.223.4641.1135. JSTOR 1692570. PMID 17742919. ^ Keller G, Abramovich S, Berner Z, Adatte T (1 January 2009). "Biotic effects of the Chicxulub impact, K–T catastrophe and sea level change in Texas". Palaeogeography, Palaeoclimatology, Palaeoecology. 271 (1–2): 52–68. doi:10.1016/j.palaeo.2008.09.007. ^ Morgan J, Lana C, Kersley A, Coles B, Belcher C, Montanari S, Diaz-Martinez E, Barbosa A, Neumann V (2006). "Analyses of shocked quartz at the global K-P boundary indicate an origin from a single, high-angle, oblique impact at Chicxulub" (PDF). Earth and Planetary Science Letters. 251 (3–4): 264–79. Bibcode:2006E&PSL.251..264M. doi:10.1016/j.epsl.2006.09.009. hdl:10044/1/1208. ^ Mayhew, Peter J.; Gareth B. Jenkins; Timothy G. Benton (January 7, 2008). "A long-term association between global temperature and biodiversity, origination and extinction in the fossil record". Proceedings of the Royal Society B: Biological Sciences. 275 (1630): 47–53. doi:10.1098/rspb.2007.1302. PMC 2562410. PMID 17956842. ^ Knoll, A.H.; Bambach, R.K.; Canfield, D.E. ; Grotzinger, J.P. (26 July 1996). "Fossil record supports evidence of impending mass extinction". Science. 273 (5274): 452–457. Bibcode:1996Sci...273..452K. doi:10.1126/science.273.5274.452. PMID 8662528. ^ Ward, Peter D.; Jennifer Botha; Roger Buick; Michiel O. De Kock; Douglas H. Erwin; Geoffrey H. Garrison; Joseph L. Kirschvink; Roger Smith (4 February 2005). "Abrupt and Gradual Extinction Among Late Permian Land Vertebrates in the Karoo Basin, South Africa". Science. 307 (5710): 709–714. Bibcode:2005Sci...307..709W. CiteSeerX 10.1.1.503.2065. doi:10.1126/science.1107068. PMID 15661973. ^ Kiehl, Jeffrey T.; Christine A. Shields (September 2005). "Climate simulation of the latest Permian: Implications for mass extinction". Geology. 33 (9): 757–760. Bibcode:2005Geo....33..757K. doi:10.1130/G21654.1. ^ Hecht, J (2002-03-26). "Methane prime suspect for greatest mass extinction". New Scientist. ^ Jenkyns, Hugh C. (2010-03-01). "Geochemistry of oceanic anoxic events". Geochemistry, Geophysics, Geosystems. 11 (3): Q03004. Bibcode:2010GGG....11.3004J. doi:10.1029/2009GC002788. ISSN 1525-2027. ^ Long, J.; Large, R.R. ; Lee, M.S.Y. ; Benton, M. J.; Danyushevsky, L.V. ; Chiappe, L.M. ; Halpin, J.A. ; Cantrill, D. & Lottermoser, B. (2015). "Severe Selenium depletion in the Phanerozoic oceans as a factor in three global mass extinction events". Gondwana Research. 36: 209–218. Bibcode:2016GondR..36..209L. doi:10.1016/j.gr.2015.10.001. ^ Berner, R.A., and Ward, P.D. (2004). "Positive Reinforcement, H2S, and the Permo-Triassic Extinction: Comment and Reply" describes possible positive feedback loops in the catastrophic release of hydrogen sulfide proposed by Kump, Pavlov and Arthur (2005). ^ Kump, L.R. ; Pavlov, A.; Arthur, M.A. (2005). "Massive release of hydrogen sulfide to the surface ocean and atmosphere during intervals of oceanic anoxia". Geology. 33 (5): 397–400. Bibcode:2005Geo....33..397K. doi:10.1130/g21295.1. Summarised by Ward (2006). ^ Ward, P.D. (2006). "Impact from the Deep". Scientific American. 295 (4): 64–71. doi:10.1038/scientificamerican1006-64. PMID 16989482. ^ Wilde, P; Berry, W.B.N. (1984). "Destabilization of the oceanic density structure and its significance to marine "extinction" events". Palaeogeography, Palaeoclimatology, Palaeoecology. 48 (2–4): 143–62. Bibcode:1984PPP....48..143W. doi:10.1016/0031-0182(84)90041-5. ^ Corey S. Powell (2001-10-01). "20 Ways the World Could End". Discover Magazine. Retrieved 2011-03-29. ^ Podsiadlowski, Ph. ; et al. (2004). "The Rates of Hypernovae and Gamma-Ray Bursts: Implications for Their Progenitors". Astrophysical Journal Letters. 607 (1): L17. arXiv:astro-ph/0403399. Bibcode:2004ApJ...607L..17P. doi:10.1086/421347. ^ Melott, A.L. ; Thomas, B.C. (2009). "Late Ordovician geographic patterns of extinction compared with simulations of astrophysical ionizing radiation damage". Paleobiology. 35 (3): 311–20. arXiv:0809.0899. doi:10.1666/0094-8373-35.3.311. ^ Wei, Yong; Pu, Zuyin; Zong, Qiugang; Wan, Weixing; Ren, Zhipeng; Fraenz, Markus; Dubinin, Eduard; Tian, Feng; Shi, Quanqi; Fu, Suiyan; Hong, Minghua (1 May 2014). "Oxygen escape from the Earth during geomagnetic reversals: Implications to mass extinction". Earth and Planetary Science Letters. 394: 94–98. Bibcode:2014E&PSL.394...94W. doi:10.1016/j.epsl.2014.03.018 – via NASA ADS. ^ "Speculated Causes of the Permian Extinction". Hooper Virtual Paleontological Museum. Retrieved 16 July 2012. ^ Ceballos, Gerardo; Ehrlich, Paul R.; Dirzo, Rodolfo (2017-07-10). "Biological annihilation via the ongoing sixth mass extinction signaled by vertebrate population losses and declines". Proceedings of the National Academy of Sciences. 114 (30): E6089–E6096. doi:10.1073/pnas.1704949114. ISSN 0027-8424. PMC 5544311. PMID 28696295. ^ a b c Franck, S; Bounama, C; von Bloh, W (2006). "Causes and Timing of Future Biosphere Extinction" (PDF). Biogeosciences. 3 (1): 85–92. Bibcode:2006BGeo....3...85F. doi:10.5194/bg-3-85-2006. ^ Lehrmann; D.J. ; Ramezan; J.; Bowring; S.A.; et al. (December 2006). "Timing of recovery from the end-Permian extinction: Geochronologic and biostratigraphic constraints from south China". Geology. 34 (12): 1053–1056. Bibcode:2006Geo....34.1053L. doi:10.1130/G22827A.1. ^ Sahney, S.; Benton, M.J. (2008). "Recovery from the most profound mass extinction of all time". Proceedings of the Royal Society B: Biological Sciences. 275 (1636): 759–65. doi:10.1098/rspb.2007.1370. PMC 2596898. PMID 18198148. ^ Sidor, C. A.; Vilhena, D. A.; Angielczyk, K. D.; Huttenlocker, A. K.; Nesbitt, S. J.; Peecook, B. R.; Steyer, J. S.; Smith, R. M. H.; Tsuji, L. A. (2013). "Provincialization of terrestrial faunas following the end-Permian mass extinction". Proceedings of the National Academy of Sciences. 110 (20): 8129–8133. Bibcode:2013PNAS..110.8129S. doi:10.1073/pnas.1302323110. PMC 3657826. PMID 23630295. ^ Cascales-Miñana, B.; Cleal, C. J. (2011). "Plant fossil record and survival analyses". Lethaia. 45: 71–82. doi:10.1111/j.1502-3931.2011.00262.x.